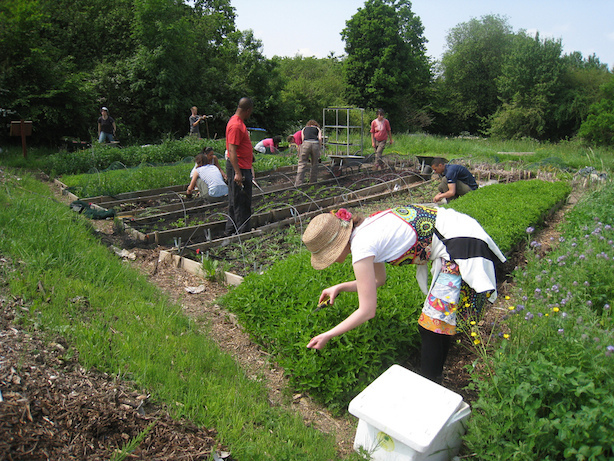 Organiclea is looking for 9 people to fill its unique trainee roles for the 2014 growing season. Each role will take on a specific area of responsibility and develop specific skills and experience in community food growing, community outreach work, local food distribution and horticulture training. These roles are aimed at people who want to develop skills to make a livelihood from community food work. The roles are voluntary and will run for 9 months from April to December 2014. All of 7 the trainees taken on in 2013, are now engaged in further training or have found employment in this sector, including: paid apprenticeships, developing their own sustainable fishing project, Gardener for a Primary School, Coordinator of the Community Food Growing Network and 2 of them are now working at Organiclea. This role will develop skills in all aspects of vegetable production. 1.5 days/week, based at Hawkwood (Tuesday am and Wednesdays). This role will develop skills required to manage the orchard, trained fruit trees, and soft fruit bushes, and develop skills in organic viticulture and wine and juice production. 1 day/week, based at Hawkwood (Fridays). This role will develop skills in harvesting for a commercial market and gain experience in all you need to know to run a local veg box scheme. 1.5 days/week, based at Hawkwood (Tuesdays and Wednesday am). This role will develop skills to support people with diverse needs to grow food, and will learn facilitation skills through supporting volunteer inductions and Organiclea’s Buddy Scheme. 1.5 days/week based at Hawkwood (Wednesdays). This role will support Organiclea tutors on gardening course and support young people to achieve accredited work experience placements; developing their skills as an adult learning tutor. 1 day/week mainly based at Hawkwood (Fridays). Read the full role descriptions here www.organiclea.org.uk/2014/02/trainee-roles-2014. Then please send a CV and covering letter telling us which role you’re applying for, specifically why you want this role and how you fit the requirements of the role. Please apply for one role only. Applicants will be short-listed according to how well they meet the criteria in the person specifications and demonstrate a commitment to sustainable urban food production. Priority will be given to applicants trying to move into employment in the community food sector, who have not had previous opportunities to undertake trainee and apprenticeship roles.